I release everything that is my own work into the public domain. That means, everything except the little skulls on the pommels, which are Bethesda's, so they're not mine to give away. What this means is that it's ok to use them for any other Skyrim mods, but if you want to port them to other games, you may not port the skull decorations. You'll either have to process a skull from whatever game you're porting to, or use just the undecorated disc pommel instead. It's still a nice pommel IMHO. Original file by Moraelin https://www.nexusmods.com/skyrim/mods/13804/? Adds 26 silver-plated elegant weapons for a more civilized age. Some are historical, some not. They range from an accurate reproduction of a historical Oakeshott Type XVIIIe Danish blade, to the Daywalker's Blade from Blade movies and fantasy elven blades. Just pick your poison and ignore the blades that don't fit your lore views. The blade of all of them is actually made of ebony, and thus does high damage, but is silver-plated for maximum damage against supernatural beings. They can be crafted with ebony, silver and leather strips. All can be enhanced with a silver bar, since if you used a grindstone on these blades, it's the silver-plating you'd need to replace afterwards. I.e., it won't be cheap or easy to make, but it gives you something to work for. Most have custom scabbards that exactly fit the blade. (The exceptions are the Great Dane, which historically wasn't carried in a scabbard, the Falx and the Blademaster's Blade, which have a WTH enough blade shape to not fit a scabbard). 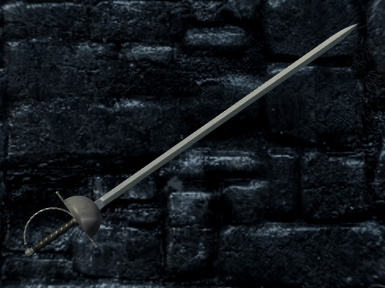 All one-handers except the Daywalker Blade have a slightly too long handle, to accomodate the game's animation moving the hand position on the hilt quite substantially between first person and third person. Ultimately I'm making game weapons not museum pieces, so they must fit the game animations. 1. a cup-hilt rapier with a silver-plated blade. It has an about 37 inch long blade, measured from tip to where it meets the cup, about 1.1 inch wide, and with a diamond section for stiffness. The blade is one of the earlier models, broader and designed for both cutting and thrusting. I had to do that because all the animations in the game are for slashing not primarily piercing. Balance-wise, it does less damage per hit than an ebony broadsword, but is fast and thus still gets good DPS, approximately on par with a daedric dagger. Plus, of course, it has the silver effect on top of that. I.e., it's a good endgame weapon, but not over the top. 2. a parrying dagger, which in this case means just a dagger with a very wide cross. I.e., it doesn't actually do anything extra for parrying, and is usable as a normal dagger. It has an about 11 inch long blade, and about 1.1 inch wide. For the stats, it's pretty much identical to a daedric dagger, plus of course it has the silver effect on top of that. 3. a broadsword, loosely based on Oakeshott Type XVIIIa swords. The fancy ricasso isn't particularly historical for that type, though. "Broadsword" is perhaps misleading, as it's actually a pretty slender sword, about 1-3/4 inch broad, and with an about 34-1/2 inch long blade, measured from tip to hilt. Just like for the others, it's a very stiff diamond-section blade and a nasty tip for piercing, though this one also sports a sharper edge for cutting. For the stats, it's on par with a daedric sword, plus the silver blade effect against undead and werewolves. 4. The Great Dane: A two-handed Oakeshott Type XVIIIe sword. The blade is about 41-1/4 inch long, about 1-3/4 inch broad at its broadest, and makes good use of taper and distal taper to be actually a light and nimble sword for its size. It is primarily a stiff piercing sword, like all diamond-section blades, but its cutting abilities should not be underestimated. It has a narrower ricasso next to the hilt, so one can grab the blade and use the sword as a short spear, and a short fuller that barely goes the length of the ricasso. The XVIIIe was used almost (but not completely) exclusively in Denmark, hence the name I gave it. Sorry, I just couldn't resist. At any rate, it seemed a good choice for Skyrim, since it is a truly nordic model. For the stats, it's on par with a daedric two-hander sword, plus the silver blade effect against undead and werewolves. 5. The Daywalker Blade: exactly what it sounds like. It's the sword from the Blade movies. It has a blade that's just a little over 26 inches long, and a handle that's a little over 9 inches long. Unlike the movies, it goes on the hip instead of on the back, since it's a one-handed weapon and that's what the game's animations do with one-handed weapons. Sorry. It's often incorrectly referred to as "Blade's Katana", but really the blade bears no resemblance at all to a katana blade. It's ahistorical in that nobody actually built one in the middle ages or renaissance, but realistically it's perfectly possible to craft for any smith that could do the rapier. For the stats and materials, it's identical to the rapier. 6. a silver zweihaender: this actually has a blade that's slightly too wide for a real German Zweihaender made for combat (though ceremonial models could be even more massive), but it's more in-line with the existing Bethesda greatswords, for those who like their fantasy weapons beefier. It's still more slender than the Bethesda swords, but less so than the Great Dane. Anyway, it has an approximately 2-1/4 inches broad blade, and about 53 inches long from tip to cross. The blade is one of the earlier ones, without much of a ricasso or any parrying hooks. As usual, it has a stiff diamond section and a very sharp tip, although it has one of the most accute edge angles. I.e., if you're strong enough to swing it, it would realistically have tremmendous cutting power with that edge. It's not just for piercing. For the stats and materials, it's identical to the Great Dane. 7. a silver ceremonial zweihaender: this weapon is simply too big for a historical combat blade, and doesn't make any pretense of even vaguely resembling any Oakeshott type. Any sword with this broad a blade would be either ceremonial or an executioner's sword (though those had no piercing tip.) It is however the most in line with Bethesda's silly huge greatswords, if you prefer that kind of thing. It has a slightly over 2-1/2 inch broad blade and about 51-3/4 inch long. Just like the others, it is a stiff diamond section blade and a nasty tip for piercing killmoves, though like the other zweihaender it does have an extremely sharp edge for cutting too. 8. a silvered Ayleid Sabre. It's loosely based on a Turkish yatagan and a Circassian/Cossak shashka and a Japanese katana, but in the end it's an elegant fantasy elven sabre, not a historical blade. Lenticular backsword blade with a wide-ish fuller towards the back, and a razor sharp edge, which is to say it's realistically a slashing blade, although it does sport a very sharp tip for those piercing killmoves. About 1-3/4 inches broad for most of its length, although it flares at the base to about 2-3/4 inches. For the stats and materials, it's identical to the broadsword. 9. a silvered Ayleid Dagger. 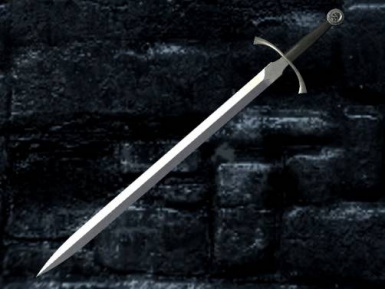 It's basically the Ayleid sabre, only cut down in length to be a long dagger or a short sword. Same lenticular fullered blade, only shorter and capable of that 15x backstab bonus. For the stats and materials, it's identical to the parrying dagger. 10. a silvered Ayleid 2H Sabre. It's basically the Ayleyd sabre, except with nearly an extra foot of blade length, and a longer handle too. Same lenticular fullered blade, except longer, slower, and with a much higher damage per hit. Some of its features are loosely inspired by bronze-age one-hander leaf-blades, but nevertheless in the end it's a pure fantasy blade. Largely hexagonal, fullered blade profile, almost half an inch thick and nearly five inches broad at its widest. Realistically this would be impossible to swing effectively by any human, but if you were Hercules or such, the sheer inertia and the very sharp edge would probably do tremmendous damage. Different blade texture than the rest of the blades here. 14. a silvered fantasy greatsword: The key word being: great. A pure fantasy blade, loosely inspired by one of the Neverwinter Nights swords. It has a blade 55-1/2 inches long, half a foot wide at the base, and about half an inch thick. This is NOT a historical, or even realistic, sword. It's mostly here for fans of Guts or Cloud and their own oversized swords. 15. a Shashka: a historical blade, invented by the Circassians (Adyghe) in the 12'th-13'th century, but then adopted by the Cossaks and later by the whole Russian army and used all the way to the end of WW2. Generally, the Cossak models tend to be shorter, narrower and less curved than the original Adyghe ones. However, there is quite a bit of variation (e.g., there can be a signifficant difference in weight and curvature between a Don Cossak one and a Kuban Cossak one) and quite a bit of overlap, so this one goes decently well with most ex-USSR ethnic backgrounds as a character concept. And at least for the Cossak blades there are historical models that are silver-plated, so that seemed like a good candidate for this mod. This particular model has a 33 inch long blade, and 1-3/8 inch wide at the base. It is a very lightweight and fast weapon, so it gets the same stats and materials as the rapier, including the stealth attack bonus. 16. an ancient Greek Kopis: not to be confused with the Egyptian Khopesh, which was a very different blade. THIS is the curved sword that Xenophon recommended for use by cavalry, not a sabre. Possibly of Etruscan origin. It's similar to the later Falcata, Yatagan and Kukri, and probably an ancestor of the first two, so you could probably also use it as a substitute for those in a pinch. Because of its short-sword size, it gets the same materials and stats as the rapier, including the speed and backstab bonus. 17. a Dacian Falx: a brutal, forward-curved sword that hit with the tip like a Lucerne hammer, except with a sword behind it to continue shearing through. It could actually puncture a Roman helmet or split a Roman shield. It also allowed some limited degree of hitting around a shield, for example to attack the sword hand, and a very nasty kind of pull-cut. It actually forced Trajan to stop the campaign to upgrade the armour of his legions mid-campaign. It's the only known occasion when the Romans did that. So if you want to give the Imperials a run for their money, yeah, this is the weapon that historically did just that. Note that in spite of the long handle, in-game it is a sword. It has the same materials and stats as the Great Dane. 18. an ancient Greek Xiphos: One of the many models of Xiphos, a stiff piercing weapon carried by the Hoplites in addition to the spear, for close combat. There are models ranging from this to triangular-shape (not section) blades, and ranging from ridged, to diamond section to actually a few lenticular ones. This is actually what the Greeks would have worn at Thermopylae, Salamis or Platea, not the monstrosity from the movie 300. Well, the Spartans would have had one with half the blade lenth, more of a long dagger than a sword. This one has a 22 inch long blade and about 2-1/4 inch wide at its widest. The scabbard is rectangular, rther than following the blade shape, as historical xiphos scabbards were. Because by medieval standards it is really just short-sword size, it gets the same materials and stats as the rapier, including the speed and backstab bonus. 19. The Diphos: a pure-fantasy two-handed scaled-up Xiphos, invented by Zombie Tools. I based mine on an actual Xiphos, though, instead of their lenticular fullered blade and fantasy hilt. So, you know, it at least resembles a historical sword. Unlike many other fantasy design, despite its paddle width, this one could actually work as a practical combat sword. The ZT one certainly does. The shorter blade still keeps weight rather realistic for a combat two-hander, in spite of the width, and the point of balance reasonably close to the hilt. If the shorter reach and lack of handguard don't bother you, you could actually fence with one of these, in addition to decapitating undead. This one has a 33 inch blade, and 3-5/16 inch at its widest. Same stats and materials as the Great Dane. 20. a Light Sabre: a light infantry sabre. Sorry, I couldn't resist the pun. Since it's essentially the shashka with a different hilt, just like the shashka it gets the same stats and materials as the rapier, including the stealth attack bonus. 21. a cutlass: same as the sabre, except shorter and broader. 22. a Turkish Kilij: actually, this blade type was used as far as Poland and Hungary (e.g., the Polish Karabella) and Afghanistan and India in the other direction, not to mention by many of the Western nations (e.g., the Mameluke sword,) but it was the Turks that came up with the design. These blades had a reputation in the 19'th century as being some of the best cutting swords, and the heavier top and curvature sure help with that. The yelman (the back of the flared part near the tip) is actually sharpened too, allowing some attacks with the back like a two-edged sword. It can also pierce, though not as accurately as a straight sword. The one added by the mod has an about 3 ft long blade. The blade outline is historical, the fuller and cross are somewhat atypical for a turkish blade, but can be found more commonly in related blades. E.g., a Karabella often has a fuller. Same stats and materials as the broadsword. 23. a two-handed Kilij: a fictive scaled-up two-handed Kilij. As far as I know, this weapon never actually existed in Turkey, though some similar Grossmesser existed in Hungary. But, hey, I really wanted a curved two-hander with a sharp back, for those Dance Of Death back-slash animations. Same stats and materials as the Great Dane. 24. a Szabla: just means "Sabre" in Polish. This particular one is a less curved kilij on a cavalry sabre hilt. This is not the only model of sabre used in Poland, but there are such Kilij-type blades mounted on hussar sabre hilts and such. They're also featured for example in some Polish movies. 25. a Chinese Niu Wei Dao: i.e., "ox-tail saber". Although it's probably the most recognizable Chinese saber, it was never issued to the imperial army. It always was a purely civilian weapon. I gave this one a sharpened short edge for the Dance Of Death back-slash animations, but as far as I know this was generally not the case historically. 26. a Chinese Butterfly Sword: a staple of half a dozen schools of Kung-Fu. These are always wielded in pairs. Well, I say "sword", but it has only a 11-1/2 inch long blade, and 2-1/4 inches wide, so it's really a very broad dagger. As such it gets the same stats and materials as the parrying dagger. 1. Just like for the vanilla silver swords (but unlike, say, the Better Vampires mod's vampire slayer weapons,) the silver effect is a script, not an enchantment. The weapons count as unenchanted. It never runs out of silver-effect charges, and you can enchant these weapons just like you could any regular weapons. 2.The "Extra damage against undead" text is just an extra text. It doesn't mean anything more. I could just as well have them say "Really polished and shiny" or whatever. It has nothing to do with actually having the silver script. Some weapons have the text (most one-handers), while for others I omitted it (mostly two-handers), but rest assured that all can ruin a Vampire's day just as badly. Before you can craft them you MUST find and read the book describing the secret of their construction. This will give you a hidden perk that allows you to craft the weapons. Then you can go to any smithy as soon as you have some ebony or silver, and craft your unique weapons. Note that you do NOT also need the ebony smiting perk to make them. Reading the book is enough. However ebony smithing still makes a difference for sharpening them, as usual. One copy of the book has been placed in the Driftshade Refuge. It seemed the most logical place for knowledge about silver blades. Just go down the stairs, open the first door you run into, and it'll be on a table to your right. The second copy is deeper down in Driftshade Cellar, in case you missed the first one. It will be on the top shelf of a bookcase, in the room with a big brewing vat. Again, just go forward until you open the first door in the cellar, and if you see a big metal container right in front of you, the bookcase will be against the wall behind it. If you don't know where the Driftshade Refuge is, just join the Companions in Whiterun and follow their quest arc. Alternately, just type "help SOSB" (without the quotes) in the console and use player.addperk to be able to make them without the book. Extract the archive, with directories, in your "Data" folder. Select it in the list of plugin files in the launcher. Delete the .esp file from your Data directory. Delete the SOSB folder in both the Meshes/Weapons and Textures/Weapons folders. Original mod is HERE https://www.nexusmods.com/skyrim/mods/13804/? None. It shouldn't conflict with anything. Note that since this does not add recipes for the vanilla silver-swords in the game, nor replaces them, but only adds its own assortment of silver blades, it will not conflict with any mods that deal with the vanilla silver swords.